Veneers have come a long way, baby! These days, we use porcelain veneers, which look way more natural, and are very resistant to staining, which means you can safely drink coffee, wine, and black tea without having to worry too much about discoloration. In fact, because they’re so white, many people choose to whiten the rest of their teeth before receiving their veneers to get a good color match. With that being said, if your veneers do become discolored for some reason, traditional whitening techniques will not work. 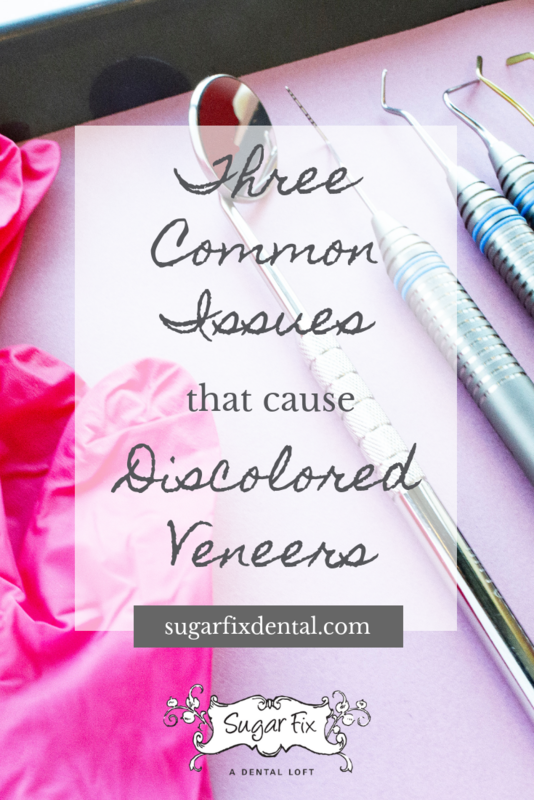 That’s why it’s important to understand the few ways veneer discoloration can occur and how to prevent it from happening to you. As you age, your gum line will naturally start to recede a little bit. This is actually where that saying “you’re long in the tooth” comes from! Although it happens to everyone, that doesn’t mean it isn’t annoying. Food can get caught in the gap between the tooth and gum line, which can lead to decay and sensitivity. If you have veneers, it can cause the adhesive to become exposed, and that composite material can very easily become stained by the foods and beverage you consume. While it isn’t technically veneer discoloration, many people find it unsightly. Unfortunately, there’s very little that can be done to prevent it, but it can stop it from getting worse. Just ask your dentist to help you keep an eye on it, and be sure to schedule those regular checkups! If you experience dental trauma (like a fall or something hits you in the face hard enough), the dentin (which is the tissue inside your tooth) can get damaged. Once this happens, the dentin starts to age more quickly and you might notice discoloration, even through the veneer. Since veneers are very thin shells of porcelain any change in underlying tooth color will show through. If this happens, you may want to consider whitening the tooth from behind so the color that reflects out through your veneer is whiter. Ask your dentist about whitening options that can be done in-office rather than attempting an at-home option. If your veneers are older, they are probably made out of something other than porcelain. These older composites are more porous, and much more susceptible to staining and darkening. On top of that, they’re not as lifelike in shape or color as porcelain veneers are. If you want your teeth to look natural and you don’t want to worry about veneer discoloration down the road, porcelain veneers are your best bet. If you already have composite veneers, consider replacing them with porcelain ones. They’ll last you a long time, keep your smile white and bright, and protect your teeth better since they chip and break a lot less easily than the composites. If you’re interested in learning more about porcelain veneers, give Sugar Fix Dental Loft a call at (773) 883-1818. We want to help you fall in love with your smile using the best cosmetic dentistry procedures and state-of-the-art technology! Contact us to set up an appointment in our gorgeous Lakeview studio.